Matt Ganuelas-Rosser, sources say, has already been informed about the trade that will send him to SMB fror RR Garcia. He didn't play in TNT's game against Ginebra on Sunday night. FIERCE rivals they may be on the court, but that won't stop TnT Katropa and San Miguel from coming to terms on a trade. 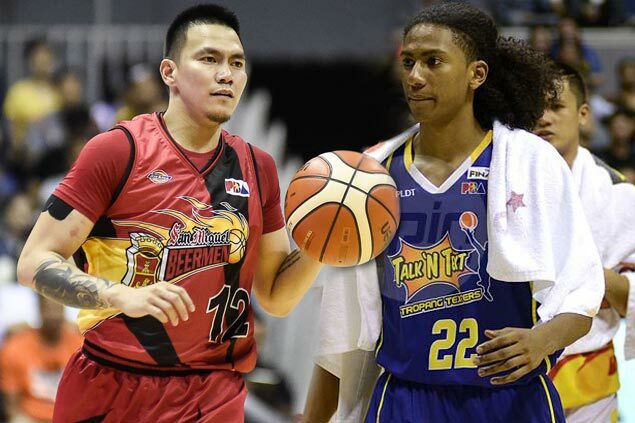 The top two franchises of the PBA are consummating a one-on-one trade involving guards RR Garcia and Matt Ganuelas-Rosser in a move that was sealed shortly after the Texters’ loss to Ginebra in the Commissioner's Cup Sunday night, SPIN.ph learned from reliable sources. Ganuelas-Rosser did not play in the Texters' second loss in seven outings while Garcia saw limited action the other day during San Miguel's demolition of Rain or Shine. Rare were the times when TnT and SMB would agree on anything, much less a trade. The last time the two franchises sealed a deal came nine years ago when the Texters sent big man Jay Washington to the Beermen in exchange for a first-round pick in a draft-day trade. TnT used the pick to draft star guard Jayson Castro. The need to have a backup for Castro prompted the Texters to part ways with Ganuelas-Rosser, who spent his first three seasons in the league with TNT. Garcia meanwhile, will be playing for his third team in the last three conferences after stops with Star and San Miguel. Sources said Ganuelas-Rosser was already informed about the trade on Sunday night. The trade papers will be sent to the PBA Office on Monday. Curiously, both players are coming off injuries. Ganuelas-Rosser has been dealing with a foot injury, while Garcia just recuperated from a nagging shoulder injury.